A convenient system for storing extra turret heads. 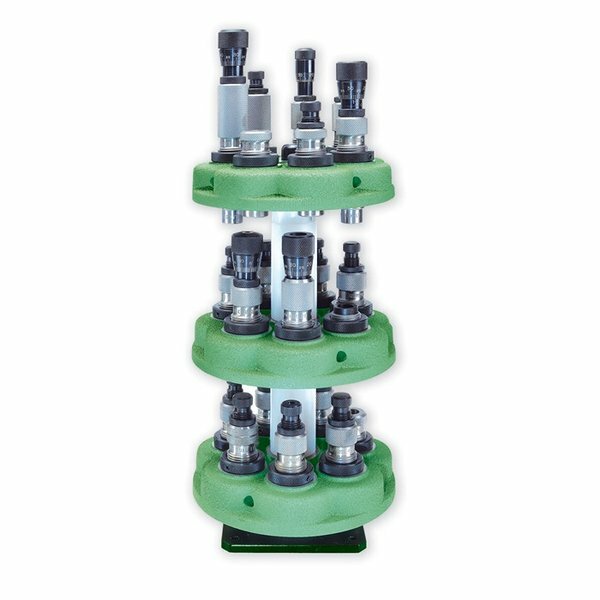 Supplied with an assortment of spacers allowing up to three turrets to be stacke with dies installed, thus preserving their adjustment. This system also prevents damage to decapping rods and pins when dies are not in use. Удобная система для хранения дополнительных башни головы. Поставляется с ассортиментом распорки, позволяя до трех башен, быть stacke с умирает установлено, таким образом сохраняя их перестройки. Эта система также предотвращает повреждение decapping стержней и булавки, когда умирает не используются. I bought one of these turret stackers but found they are 2", too short for three T7 turret heads with tall competition dies in each. I told Redding about the problem months ago but the rod has still not been extended. It's a shame because it would be a good product if the base was a bit wider and the rod a bit taller. I recently acquired the T-7 for reloading heavy duty cartridges like the 44 magnum, 480 Ruger, and rifle cartridges like the 223 Remington and the 308 Winchester. I have been using the Lee Loadmaster and the Lee Classic Turret Press for other straight cartridges. I have 4 turrets and the stacker is really necessary. I have both Lee and Redding dies sharing the same turret and I use the Redding Instant indicator for both the 223 and 308 calibers. I do remove the dial before storing. I get 3 turrets on the stacker without any problem. The unit itself is well made and has a heavy base. I am very pleased with this product as I am with all the Redding products that I have purchased from Brownells. As a matter of fact, I am thinking about ordering another one in the near future. Have a great day! Код производителя: 67950 611760679506 Удобная система для хранения дополнительных башни головы. Поставляется с ассортиментом распорки, позволяя до трех башен, быть stacke с умирает установлено, таким образом сохраняя их перестройки. Эта система также предотвращает повреждение decapping стержней и булавки, когда умирает не используются.